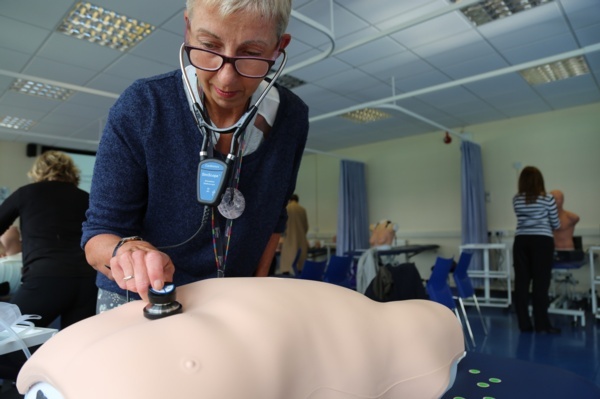 A healthcare simulation suite based at Wrexham Glyndŵr University and used by a range of professionals has been extended thanks to Health Education and Improvement Wales. The suite – which is used by a range of students on health-related courses – has been running at Wrexham Glyndŵr University for a number of years – but a wide range of new equipment has just been added thanks to a £15,000 funding boost from Health Education Improvement Wales (HEIW). The new equipment in the suite helps to simulate how a wide range of conditions in a lifelike manner – allowing students to examine the effects of diseases on organs and other body parts in a controlled learning environment before applying their learning in the workplace. Students from several departments in the university are set to use the equipment at various points, with Postgraduate students on the Advance Clinical Practice MSc among those who be making most use of the equipment. Gilly Scott, who teaches MSc students as a Senior Lecturer and Advanced Nurse Practitioner, explained that the investment in the suite was designed to cater to the wide range of specialists who undertake the programme - and others like it. She said: “Our cohorts are not just nurses – they are working as all kinds of specialists such as physiotherapists, paramedics, radiographers, pharmacists and podiatrists. These are people who are very used to working with technology – they have to keep up with it, so we, as a university, keep up with these new developments too. Senior Lecturer in Nursing, Yolanda Evans, added: “Because the environment many of these people are working in is so busy, a suite like this can give them the chance to do things in a learning environment. Having that space, without the pressure, means that people can put their learning into use over and over. Students on the Advanced Clinical Practice Programme have to build up many hours of clinical practice as part of their work – and there are already plans to further extend the suite in future. The current investment was made thanks to a grant from HEIW, a new special health authority within NHS Wales with a leading role in for the education, training, recruitment and retention of the healthcare workforce. Dean of Glyndŵr’s Faculty of Social and Life Sciences, Simon Stewart, said: “We are very grateful to HEIW for their help in funding this new simulation suite. Wrexham Glyndwr University will be using the suite with its students to mark Advanced Practice Week 2018. The week – which takes place across the UK from November 11-18 this year – is organised by the Association of Advanced Practice Educators and showcases and celebrates Advanced Practice across all healthcare settings.